Silent bidding in the annual 12x12 scholarship fundraiser for the Friends of the Visual Arts at SFA starts June 28 at The Cole Art Center @ The Old Opera House. NACOGDOCHES, Texas - Silent bidding for artwork in the annual 12x12 scholarship fundraiser for the Friends of the Visual Arts at Stephen F. Austin State University gets underway Thursday, June 28, at The Cole Art Center @ The Old Opera House in downtown Nacogdoches. The silent auction features 12-by-12-inch pieces of art created by approximately 70 artists from Nacogdoches, Lufkin and other areas of East Texas. Anyone may silently bid on the unique one-of-a-kind pieces, according to Crystal Hicks, event committee chairwoman. "We're so excited by the pieces we've received, and we're looking forward to another great event that features local talent," Hick said. Silent bidding begins June 28 at The Cole Art Center @ The Old Opera House and will continue up to the day of the art party, which is planned for 6 to 8 p.m. Saturday, July 14, at the art center. Minimum bid is $250 from June 28 through 4 p.m. July 14. Beginning at 6 p.m. on the night of the party, the starting bid for art pieces without previous bids will be lowered to $100. The auction closes at 7:15 p.m., and winners for all pieces will be announced at 7:30. Pieces without bids at 7:15 will be awarded in the raffle. The purpose of 12x12 is to raise funds for the FVA scholarships and grants that are awarded to SFA art students. Between $12,000 and $15,000 is awarded annually in scholarships to deserving students in the School of Art. The awards help students defray the costs of special projects for art classes or M.B.A./B.A. exhibitions. Some recipients have attended conferences or gone on school trips that will help with their professional development. This has included Maymester trips for art students to go to Big Bend for a special photography project. The organization also awards scholarships for elementary school students to attend the SFA Art Academy each summer. 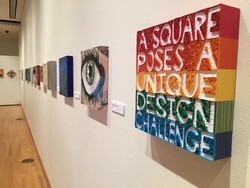 The Cole Art Center is located at 329 E. Main St. For more information about 12x12 or to become a sponsor, call The Cole Art Center at (936) 468-6557.